Procrastinators will be relieved to learn that actually you can accomplish quite a lot while procrastinating. In fact, the book itself is the result of Perry avoiding grading papers, refereeing academic proposals and reviewing dissertation drafts. It also has a practical side, offering up advice that listeners can put to use. Who knew that placing “Learn Chinese” at the top of your to-do list would inspire you to get the less monumental tasks below it done? 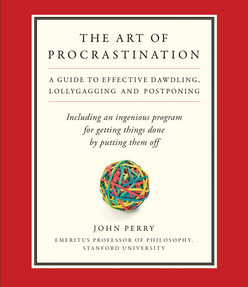 Witty, wise, and beautifully written, The Art of Procrastination will make the perfect gift for the untold number of lollygaggers out there. This charming and accessible audio educates, entertains, and illuminates a universal subject.